Once you have launched the latest version of MailServe, save the current config using the File->Save menu item, do a De-Install from the Help menu, which removes all the previous cruft, and then quit and come back to the app. You'll then get the config files, libraries and the other stuff that will work with Yosemite. 8.0 October 20th 2014. 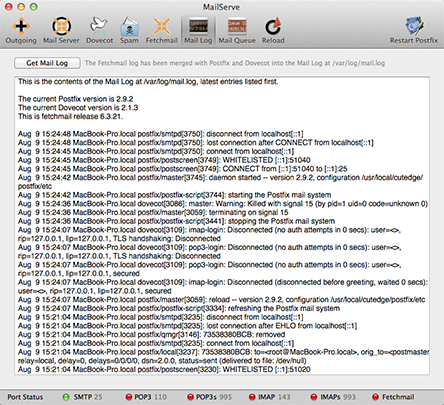 MailServe for Yosemite released. 8.0.1 October 21st 2014. 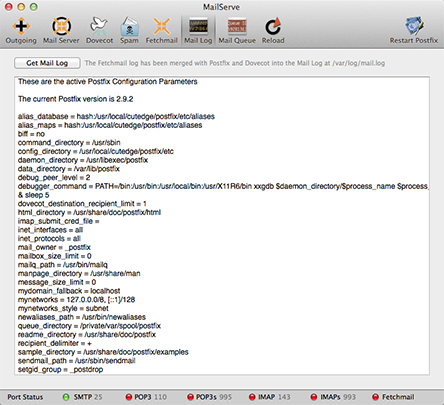 Updated MailServe for Yosemite with the latest versions of Dovecot, version 2.2.14. 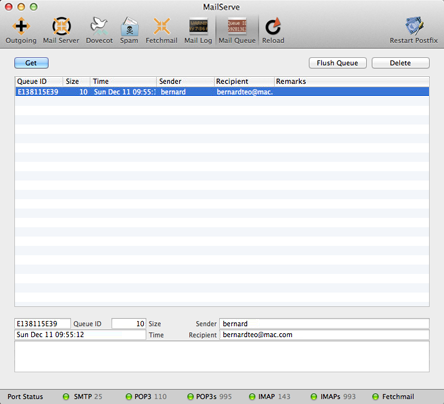 Fetchmail is still on 6.3.26+SSL, which is still the latest version. The Postfix version is 2.11.0. Users of the original 8.0 release of MailServe for Yosemite can get these latest binaries by doing a De-Install from the Help menu. Save your config first using the File menu. Then after doing the De-Install, quit and come back to MailServe, open your saved config, and then restart all your mail services. You’ll be running the latest Dovecot.